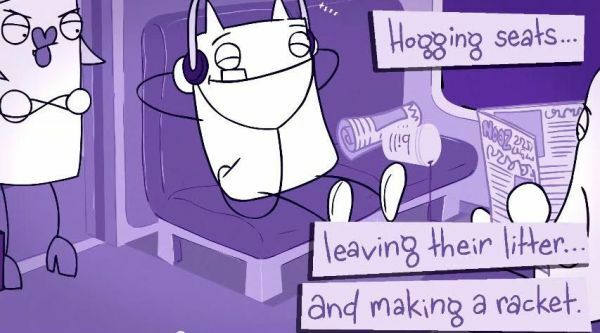 Dodgy Derek, the cartoon character created to highlight the anti-social behaviour of train fare dodging, is now acting out rail passengers’ other biggest gripes – pushing to get on trains, playing loud music on headphones and leaving litter behind. Making his second outing in a fun, short YouTube animation for Thameslink and Great Northern, Dodgy pushes in front of other passengers then boards a train. The subtitles tell the rest of the story as he sits down and turns up his music before trying to hide from a ticket inspector.